Welcome to Sanmaurs Siamese, a CFA registered cattery since 1980 and TICA registered since 1983. Sanmaurs is a small cattery in Michigan, USA. We breed Siamese to the show standard of perfection in all four classic colors. Please enjoy your visit and photos of our cats of past and present. OUR STORY: In 1978, I received a birthday present that would forever change my life. It was a 6-week-old Chocolate Point! Of course I had to hand raise her, but as time went on, "Mocherre" grew stronger and prettier. I thought she was the most beautiful cat and I wanted to take her to a show. I contacted the breeder and received my next surprise; she was ineligible because she was an AOV colorpoint and pet quality as well. This was the actual turning point. I went to the library and got every book I could find on cats and began visiting cat shows. I contacted Jeanne Singer who helped me get started and pointed me in the right direction for bloodlines. My first "real" Siamese was a lilac point male, "Singa Montaine Elete", whom I bought from Jeanne in 1979. She also urged me to purchase two females: "Toshme Venus of Sanmaurs", a Thaibok Teriyaki daughter and "Allen's Alexia of Sanmaurs", a Singa Blue Minstrel grand-daughter. During that time I had the opportunity to work with many wonderful people and exquisite bloodlines but a major life change took place and I was unable to breed for a couple of years. It was difficult to start over because so many things had changed and friends were no longer breeding, however, I was fortunate enough to recoup some of my original bloodlines. 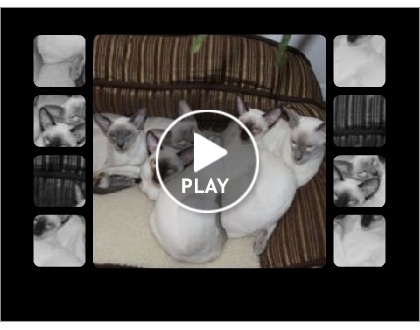 Our focus is to continue breeding and showing beautiful quality Siamese. Our kittens are from CFA/TICA registered, Grand Champion and Champion bloodlines who conform to the breed standard. We do not support or condone breeders that seek to deceive the public by advertising "Traditional" or "Classic" Siamese as if they were a separate breed. This is not a separate breed. These specimens are in fact, considered a poor quality representation of the Siamese breed. These cats will not have titles and are ineligible for show because they do not meet the required CFA/TICA standards, although they can still be registered with all associations. If a more moderate look is desired, we highly recommend looking for a reputable Tonkinese breeder. We take great pride to ensure that our cats are healthy and free of parasites. Our cats are FeLV, FIV, and FIP negative as well as PRA tested. Show & breeding cats are sold with a complete feline profile. Our pet kittens are sold with a complete health record, all shots and a health guarantee. Our pet contract requires the kitten is neutered/spayed at a veterinary-recommended age, usually between 6 and 9 months. Once proof of altering is received, we provide the registration papers. This also serves to protect our beloved breed from breeding practices that are less than responsible as well as providing the option to show your baby in Premiership. Our cattery remains small to ensure everybody is spoiled rotten!